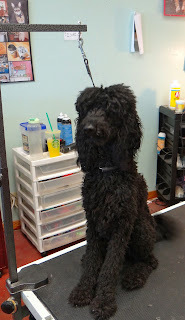 My nephew's wife, Claudia, with whom I played yesterday at Whiskeytown Lake, owns a dog grooming business in Redding. I've occasionally taken Lacy for Claudia to groom when I've been in town. Boy did she need it this time; she hadn't been clipped or bathed since February in Sayulita - and that grooming, shall I say, left a little to be desired. 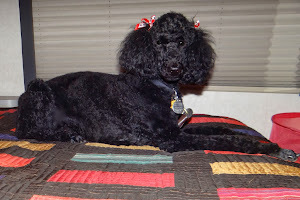 For our RV adventure it was fine; fortunately she is blessed with no doggie odor and is totally black so one doesn't 'notice' too much when she's badly in need of a cut and wash. I've also come to the conclusion that I need to start doing a lot of her grooming myself - as each visit to the 'beauty salon' costs an arm and a leg! Claudia agreed to 'teach' me how to clip and groom Lacy and today was the day. 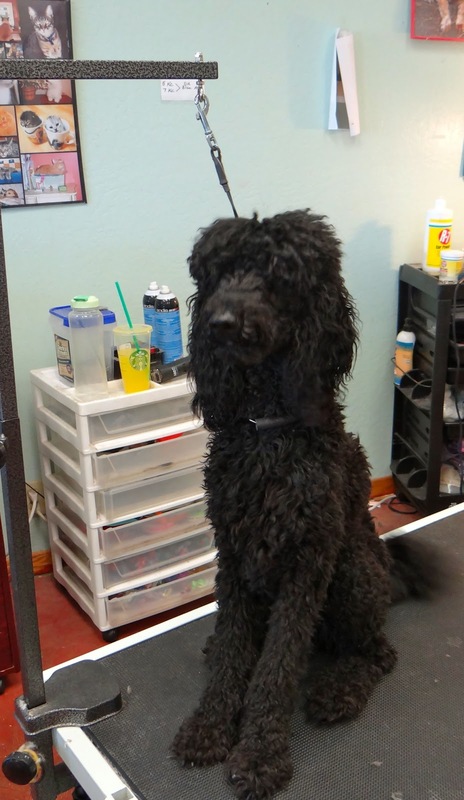 This dog is in process of blooming into a fantastic lady; she's been to obedience school and has the tools to be well-behaved and a joy to be around. Now, we just need to complete 'puppyhood' as she still occasionally gets very excited and rather rambunctious. My current 'dog-whisperer' behavior tactic is to maintain a very calm demeanor around her, hoping she'll emulate that which she sees! Okay, so it works sometimes! A little difficult to make out how long her coat is - but check her feet - long hair! 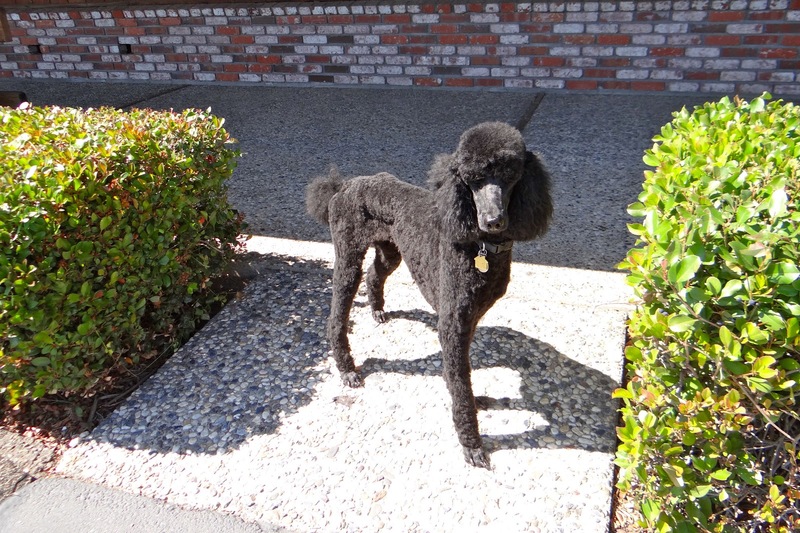 Lacy is a registered, well-bred Standard Poodle; however, she is quite delicate looking (that's skinny). The breeder tells me that her mom didn't start to put on her adult weight (now weighs 39 pounds - still light for a Standard) until she was almost 5 years old. Lacy was 3 on March 31st and weighs in at a whopping 26 pounds! Most Standards are in the 50-65 pound range. As we plan to do a lot more RV adventuring this Summer, I requested that Claudia instruct me in short hair-dos. Claudia explained and demonstrated how to use the various clippers, scissors, brushes and combs; then I actually did a lot of the clipping myself. That could be why there are a few divots here and there! Her hair is very curly, thick and grows rapidly. I 'm completing my personal inventory of grooming tools and hope to avoid the expense and result insecurities of unknown grooming salons along the adventure route. The whole process took almost four hours; I'm relaxing and recovering and Lacy is sacked out. Also, our Summer heat caught up with us today; it's about 98 degrees outside and not much cooler inside my RV right now. Mary Pat, I have just caught up on your wonderful adventures and met your beautiful family (through your pictures and words, of course). Every one of your days is filled with something terrific. That is what life is all about and I'm so happy for you! Hi Paula: Meeting you and Jerry is one of my fondest memories of The Mexican Adventure of 2013! I am very serious about wanting to see your wonderful part of the World - and both of you too. 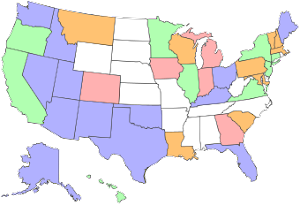 Currently I'm involved in lots of decisions about keeping / renting / selling my house, repairing / updating Daphne Dolphin vs upgrading to a newer rig and lots of family related happenings. Yes, my days seem filled with the wonders of retirement! During my long stay in Guatemala - at the beginning of this retirement period - I didn't really 'feel' retired because I was going to school at 8 each morning 5 days a week. It's really satisfying to actually BE my own boss! Love you two!